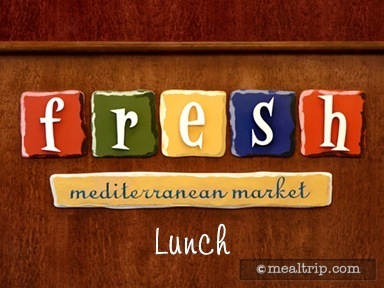 The Fresh Mediterranean Market is one of those few locations that are only open for breakfast and lunch (no dinner). Located in the Dolphin Hotel, the concept here is "made with the best ingredients possible", but it's not exactly farm-to-table because the ingredients are all "Mediterranean"… so Spain, Italy, France, Greece, and Morocco. The à la carte lunch menu is dominated by salads (and one "burger and eggs" entree)… three "prepared"... a Blackened Fish Salad, Thai Chicken Salad, and a Southwest Steak Salad, along with an option to build your own selecting various items off a menu card. So, you can totally build a "Greek Salad" or a "Chicken Caesar Salad" … there's enough stuff on the card to make just about any kind of salad you can dream up! There is also a "lunch buffet" that features chilled delicacies, salads, soups, grilled and rotisserie meats. Did I mention there's a dessert bar? If you order any item from the à la carte menu, you can visit the gourmet dessert bar as many times as you like! Which is the whole reason you're eating a salad in the first place!!! There are also a couple of interesting cocktail options here as well (for adults) like the Istanbul Coffee, made with Ouzo or an Egyptian Honey Bourbon Tea! Wine from the Mediterranean region is also available.